Flight Lieutenant Dr Malcolm Kendall-Smith has been described as an intense and thoughtful individual with a "very informed conscience". 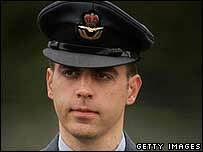 The RAF doctor has been found guilty of disobeying orders at a court martial after he refused to serve in Iraq, claiming his actions were justified because the UK's involvement was illegal. He was born in Brisbane, Australia, where his father was a consultant radiologist and his mother was studying for a PhD. At school he gained top grades in physics and biology and he received similar honours for his medicine degree which he took at Otago University in Dunedin, New Zealand. It was at this time that he took dual British/New Zealand citizenship. He chose to work in hospitals in Australia before returning to New Zealand to take a degree in philosophy. Kendall-Smith gained top grades for his thesis on the secular and rational morality of Immanuel Kant and his success led to him taking up a post as a tutor in the subject at Otago University. Charles Pigden, a senior lecturer in philosophy who marked his thesis, said: "Kant was the philosopher who makes doing the right thing of critical importance, people who are interested in Kant's ethics, they're keen on morality. "Maybe Dr Kendall-Smith thought that in joining the British armed forces he wouldn't be getting into morally dubious stuff. Which sadly proved not to be the case." And Grant Gillett, an Otago neurosurgeon and biomedical ethics professor who taught and worked with Kendall-Smith, said: "He had a very informed conscience. "He's a thoughtful individual, quite intense in some ways. One felt like saying to him 'lighten up'." Kendall-Smith began his RAF career in August 2000. He had flown to the UK to join the RAF as a commissioned officer at the rank of flight-lieutenant on a six year short-service commission. He had served twice in Iraq before he refused his deployment, deciding that the invasion was illegal after studying various books and articles. From November 2000 to August 2001, he was based at RAF Brize Norton in Oxfordshire before working at Peterborough Hospital. In 2002, he was based at RAF Lyneham, Wiltshire, before becoming a senior house officer in psychiatry based at Brize Norton. On July 1, 2002, he was deployed as a GP registrar at RAF Thumrait, Oman, and on February 1, 2003, he was posted to RAF Ali Al Salem in Kuwait for the Iraq invasion. In October 27, 2003, he was deployed to RAF Al Udeid, Qatar. Since September 2003 he has been based at RAF Kinloss in Scotland and on October 27 2003 he was deployed to RAF Al Udeid in Qatar.